12-Year-Old’s Interest in History Leads Her to WW2 Games | Armchair General Magazine - We Put YOU in Command! Julia Cifone is the 12-year-old daughter of Chip Cifone, ESPN’s senior director of client technology services and support, who talked with Armchair General about his 30-year collection of World War II memorabilia. Julia Cifone also agreed to talk with ACG about her own interest in history, which includes playing World War II–themed games on her Xbox. 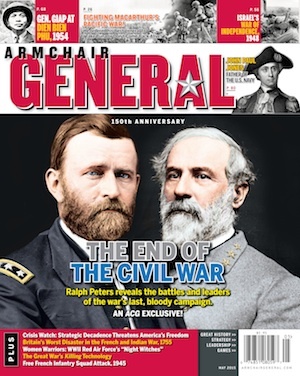 ArmchairGeneral.com: Parents and teachers often struggle to get young people interested in history. How did you become interested in it? Julia Cifone: Through my dad and being around his collection, as well as the History Channel. ACG: What are some of the things you and your dad do together, related to history? Julia Cifone: Play World War II–based video games, watch the History Channel and World War II movies together. ACG: Are there particular historical subjects or people you especially like learning more about, such as World War II or Amelia Earhardt? Julia Cifone: We haven’t learned about this period in school as of yet so I am not familiar with specific characters other than Adolf Hitler and President Roosevelt. I hope we do spend more time in the grades ahead. ACG: Do any of your friends ever ask why you like "that history stuff?" ACG: What are some of your interests apart from those related to history? Julia Cifone: Technology, music, video games and shooting. ACG: We understand you like to play World War II–themed console games. What are your favorite games, and why are they your favorites? Julia Cifone: Call of Duty and Brothers in Arms. I like the story lines and I get to play online with my friends. ACG: Sad to say, some male gamers think online gaming is a tree house with a "No Girls Allowed" sign. What would you say to them? Julia Cifone: I play online with my friends. The boys in my class think it’s cool that I play these games—and often beat them. ACG: Thanks for talking with us. Is there anything you’d like to say in closing? Julia Cifone: Just thank you for doing this interview with me and my dad. Click here to read what her dad, Chip Cifone, says about his 30-year collection of World War II memorabilia.